This 2-door minimalistic wardrobe wardrobe has two external drawers and has a wooden finish with the Sorrel Teak Laminate. To make it a little more appealing, one of the drawers has been given a light champagne color. The two external drawers can be used to store file or some other things which need to be segregated, but accessed frequently. Interior: This has a very basic interior design that has a lot of removable full shelves. 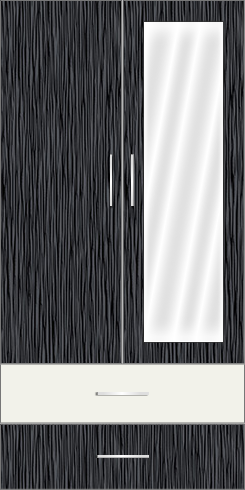 If there are a lot if big storages required in a room, this wardrobe can be used. If need be, the top two shelves can be removed to have cloth hangar.Some of the features can be added at a very low price.